My mom was not particularly proud of her Polish heritage. She adored and was devoted to her brothers and sisters, and she always told me she was “Papa’s favorite” (though I suspect Papa—my grandfather—was the type who routinely made sure all of his kids and grandkids thought they were his favorite, and I even suspect that each of them was his favorite in different ways and at different times—cf the Erma Bombeck article of many moons ago) –but she just really didn’t much like talking about her Polish roots. She was American, she said, “from the day I was born, right here in the good old USA.” The only time she ever made anything Polish at home, as far as I knew, was when my grandmother was staying with us. This is why I was surprised to discover only recently that her wonderful pork chops, the pork chops I grew up on and that I still make for my own family today, were actually Polish. My mom just called them “breaded pork chops.” She never bothered to mention that “breaded pork chops” in Polish is kotlety schabowy. Break the egg(s) onto the first plate and scramble well. You can add a teaspoon of water to make it stretch a little further. Put the crushed crackers on the second plate. Lightly season the chops to your taste with salt and pepper on one side and Lawry’s on the other. Dip one chop at a time into the egg and then into the crumbs, coating thoroughly. Set prepared chops on the third plate while you do the rest. Heat about 1/3 cup of oil in the cast iron skillet (depends on how many chops you’re doing). 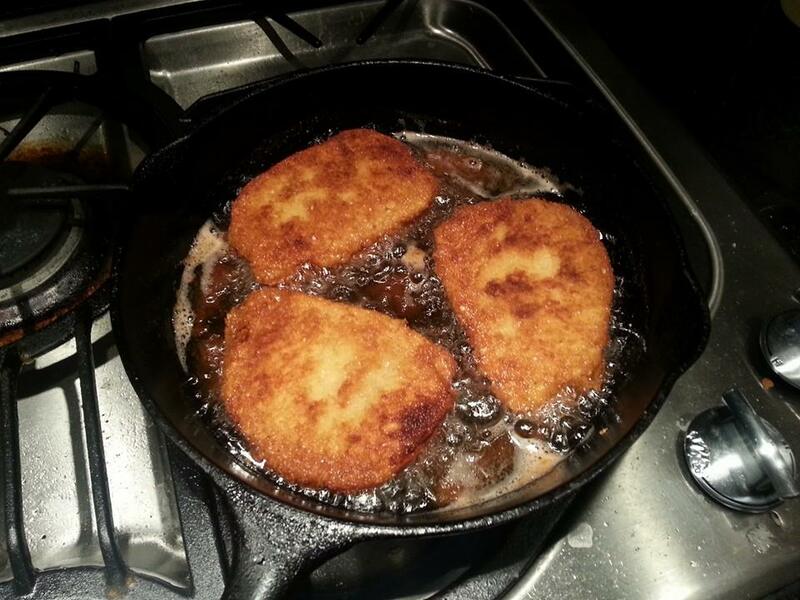 Fry the chops on medium heat, 3 at a time, about four or five minutes on each side until golden brown. It doesn’t matter if they’re not cooked all the way through. If you’re only doing three or four, they should all fit in the pan you fried them in. Just put the lid on the pan and bake at 350 degrees for ½ hour to 45 minutes (depends on thickness of chops). Remove the lid in the last ten minutes or so. If you’re making more than 3 or 4 chops, you can put them all on a jelly roll pan and cover it with foil so they can all bake at once. That’s what I did tonight. These are tender and juicy, never dry or tough, and they have fantastic flavor. My mom always served them with corn on the cob and some kind of noodles or macaroni and cheese. A great comfort food dinner! BONUS: How to make perfect corn on the cob every time! Clean the ears and cut off the ends. Heat water to boiling in a pot large enough to hold however much corn you’re making. Add about ¼ cup milk and 1 tsp sugar for every quart of water. DO NOT ADD SALT. Put the corn in the boiling water. Cover and turn off the heat. In 15-20 minutes you will have perfect corn. Good idea to put them in the oven for the last bit of cooking to keep them moist! Oh, that sounds good! 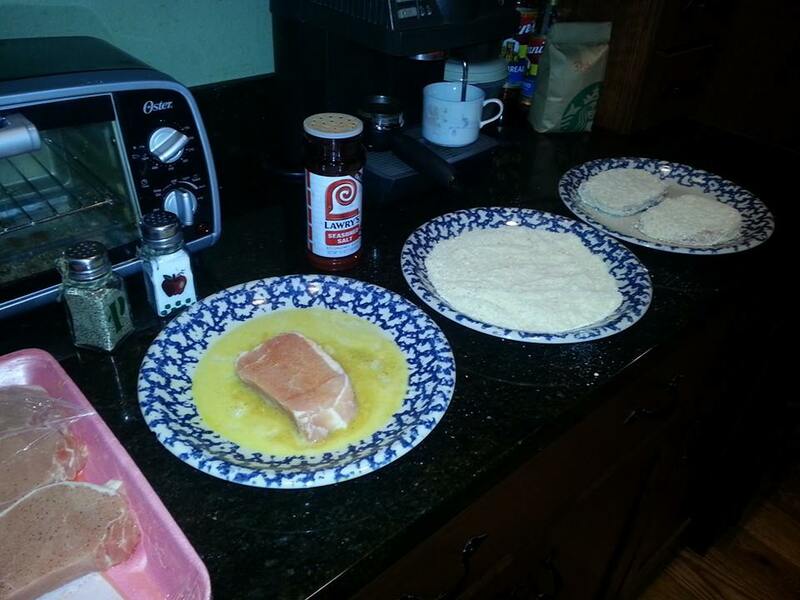 Grey Poupon is great on chicken breasts, too. Mmm. Sounds yummy. Definitely going to try to milk trick for the corn. Can’t wait to hear how it goes. 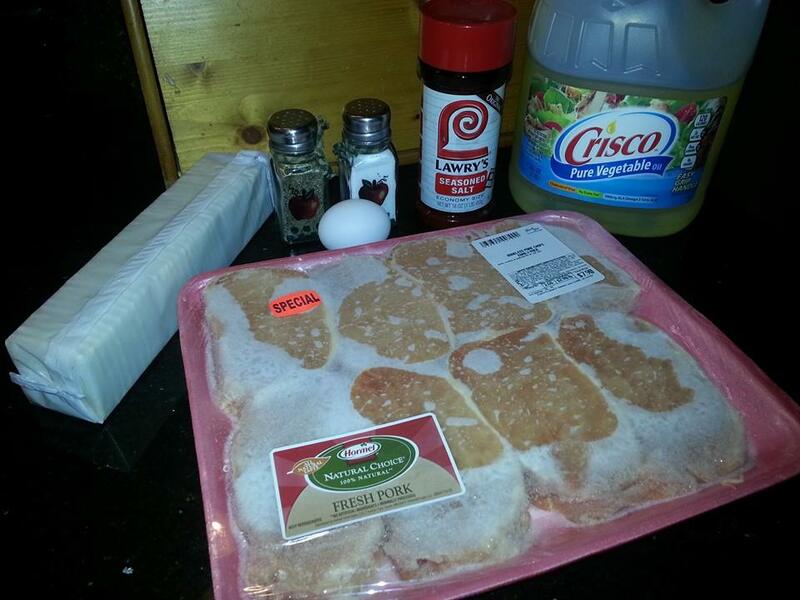 It sounds like other pork chop recipes I’ve seen, although I’ve never tried making them from Saltines. I’ve seen similar recipes too, but they usually use bread crumbs or Panko crumbs and I’ve never seen the step of putting them in the oven. Everyone wants to be sure their pork is cooked all the way, but chops get tough if they cook too fast.